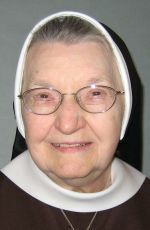 Sister Fabia Dzienis, 99, of the Bernardine Franciscan Sisters Third Order Regular of St. Francis, died Jan. 11 of natural causes at St. Joseph Villa in Reading, Pa., where she had resided since 2007. Born in Philadelphia, she was a daughter of the late Julian and Alexandra (Winkiewicz) Dzienis. Sister Fabia entered the Bernardine Order on June 20, 1935, and was in her 80th year of religious life. She earned a Bachelor of Science degree in education from the Augustinian College of Villanova and graduated from Mt. Carmel Hospital in Columbus, Ohio as a medical technician. She served her ministry in Nebraska, Ohio, Pennsylvania, Rhode Island and Virginia as an elementary teacher, nurse in training, laboratory training, medical technologist, supervisor, laboratory supervisor, health care aide, bookstore manager and library staff member. A viewing will be held at St. Joseph Villa in Reading on Thursday, Jan. 15 at 4 p.m. The funeral Mass will be celebrated at 11 a.m. Friday, Jan. 16 at Sacred Heart Convent Chapel, Mt. Alvernia, Reading. Burial will follow in the Bernardine Franciscan Sisters’ cemetery, Mt. Alvernia.